We grill out a lot at our house. SO, I am always on the look out for a new recipe. I find that variety is the key to dinner. If you make lots of different things, you don't get bored with eating the same ol' thing all the time. Over the past year, I have discovered that I really like chipotle peppers. I love the smoky heat they add to a dish. We've made several grilled chicken chipotle dishes, but I wanted to try a new one. I decided to combine the chipotle peppers with some of my other favorite ingredients - honey and orange juice. The chicken turned out great. It was tender and juicy, with tons of flavor. I really loved the hint of sweetness that the citrus and honey added to the chicken; it helped balance out the spiciness of the chipotles. This actually turned out to be one of my favorite chicken marinades. I plan on making fajitas with it next time. Combine all ingredients in a food processor and pulse until the marinade is smooth. Pour over chicken and marinade for at least two hours. Grill until done - internal temperature reaches 165 degrees. 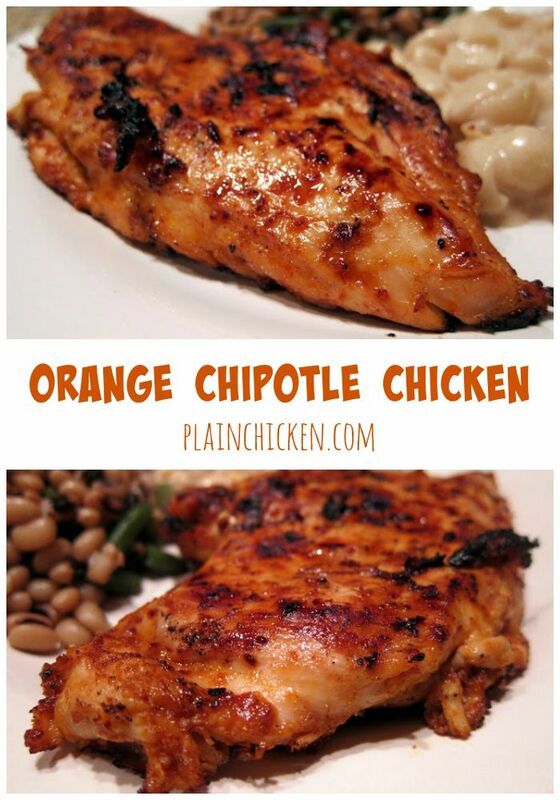 Chipolte and Orange, that one really got my attention. Another one bookmarked. Looks delicious Stephanie. What a great dish that I will have to try! It looks delicious! Great looking meal. My husband is so boring. He wants the same things all the time. Beautiful color. Looks amazingly good. This looks really delicious! Love the gorgeous colour! This looks tasty! Nicely done. Love the combination of sweet and heat. Great recipe. I'm kind of wimpy as far as hot and spicy goes, but I think I can handle this. It sure looks delicious! You are the QUEEN of chicken! I'm not even a huge fan of chicken yet I come away from your blog craving it. Another winner, Steph! I was so excited about this but was disappointed in the flavor..or lack of :( I actually marinated this all day with the ingrediants it called for. I even put little slits in the top of my chicken before adding to the marianade? Not sure what went wrong but it had little to no flavor. I only tasted a hint of the smokey chipotles. Any thoughts?